Our 180 piece fluorocarbon O-Ring Kit offers a slightly diffferent selection of sizes than our US Industrial Fluorocarbon Kit. 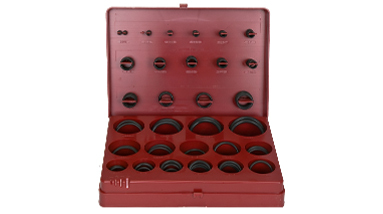 This kit also has fewer pieces of each size, making it more affordable for small shops and garages, but still provides a useful selection of chemically resistant fluorocarbon O-Rings in popular sizes. Deluxe box as pictured. Generic contents identification label on top lid.